In metallic champagne with cream interior. We sold this fine SL last year but a change of plans, and a beautiful Morris Minor Convertible, mean that it's now back at Pye Corner. This pristine 300SL was supplied by Charles Sidney in Bradford in October 1986. 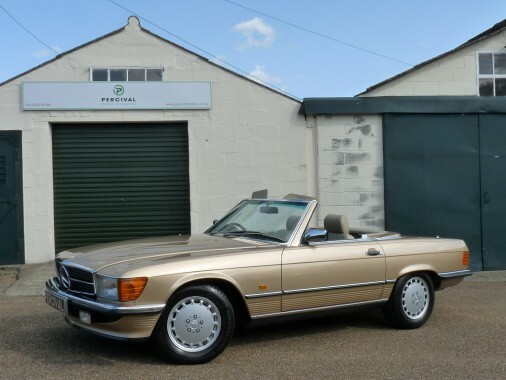 It has had four owners since new and has covered only 61,000 miles and comes with a fully stamped service history from Mercedes dealers and specialists. The first owner kept the car until 2013 and it appears to have lead a sheltered life. It is in unmarked, spotless condition. The paintwork in pristine with no stone chips and marks on the edge of the doors caused by careless opening. The chromework is as new and the wheels are imaculate. The interior shows no wear whatsoever and the wood veneers show no cracks or marks. There is an upmarket Becker stereo fitted. The brown hood, contrasting nicely with the body colour is original and the hard top is immaculate. The engine bay is nicely detailed. The Mercedes is in fine order throughout backed up its low mileage and ownership and full service history.